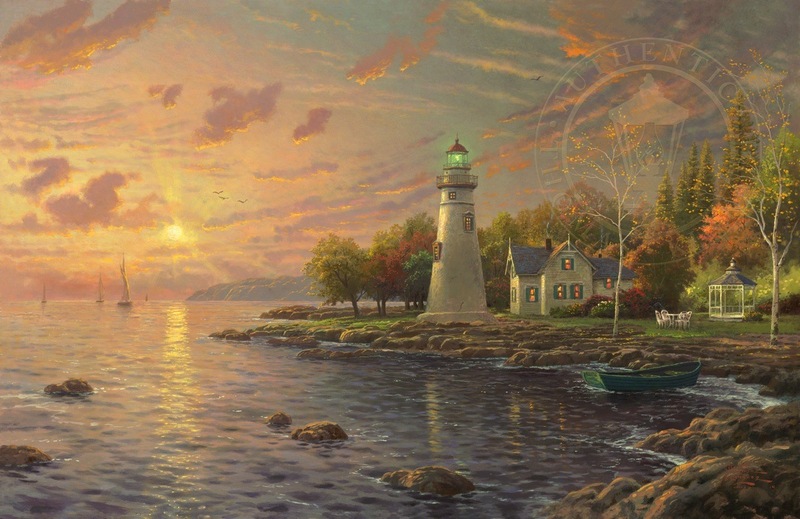 Serenity Cove, featuring a lighthouse inspired by Marblehead Light on Lake Erie, celebrates the guidance my faith offers as I face life's transitions. For me, the four boats sailing towards the horizon symbolize the life journey of my four daughters as they grow into adulthood. In nature, times of change are often the most brilliantly colored. The transition of sunset paints the fading hues of autumn with a heavenly radiance; in this, the still waters of Serenity Cove reflect the glory of earth and sky. 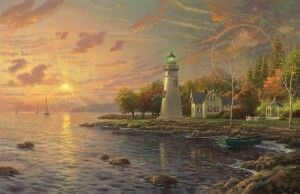 The lighthouse is not just a beacon of hope and symbol of faith; it is also a cozy family cottage. The gazebo and lawn furniture suggest the comfortable life lived within this safe haven. © Thomas Kinkade, The Thomas Kinkade Company, Morgan Hill, CA. All rights reserved.